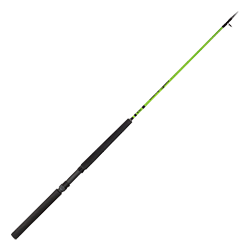 Incredibly lightweight, with tip actions that could only be called "delicate" but underneath lurks the durable rod with real backbone. Great for jigging with ultra-thin line. Powerwall IM-6 graphite blanks, Fuji aluminum oxide concept gudies, Fuji graphite reel seat, easy gripping EVA foam handle.